From the author of The Truth Beneath the Lies, which the bestselling author of One of Us Is Lying, Karen M. McManus, called "smart, suspenseful, and unpredictable," comes a psychological thriller about a girl who must keep her arsonist ways hidden--or watch her life go up in flames like a wildfire. Jenny didn't want to move to the creepy, possibly haunted town with her dad. But the cops are on to her, and the only way she can protect herself is by moving as far away from her hometown as possible and staying out of trouble. But even after she moves, Jenny still gets the itch. The itch to light a match and then watch it burn. It's something she hasn't been able to stop, ever since an accident years ago. Now, in a new town, Jenny has the strange feeling that someone is watching her every move. Will her arsonist ways be exposed? Or is the burning truth deep inside her a greater danger? Jenny is an arsonist who has an addiction of watching things burn. When she moves in with her dad, she hopes to leave her arsonist ways behind her. However, like with an addiction, it isn't easy. Jenny tries to keep things small and convinces herself it's okay because she isn't hurting anyone. Secrets never remain hidden in a small town though. In the new town, Jenny manages to make some new friends. The new life doesn't make it any easier to stifle the need to burn things. When murders start happening, certain clues seem to keep coming back to Jenny. Can she solve the mystery before it's too late? 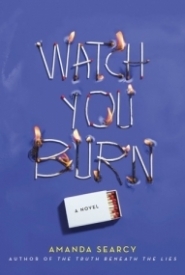 WATCH YOU BURN is a thriller with a realistic teen with real problems as the main character. Jenny's addiction to fire is like any other addiction and just as dangerous. I really liked that this story touches on arsonists because I don't see it too often. The twists and turns keep you reading, but it isn't hard to put the clues together as the reader. Final Verdict: I would recommend this to fans of fire, thriller, mystery, and sensitive topics like addiction.